Flight Design USA has a network of distributors, dealers, service centers and flight schools. Our distributors have the latest model aircraft available for demonstration, sale and are qualified service centers. In addition, many of our regional dealers have airplanes available locations around the country. A local dealer may also arrange local pickup and delivery of your new aircraft. If you purchase a used plane, you should use one of our flight schools and arrange training. Using the transition syllabus is highly recommended. Owner responsibilities for LSA aircraft ownership are spelled out in the AOI. Please make sure that you review that guide and that you comply with all the provisions. 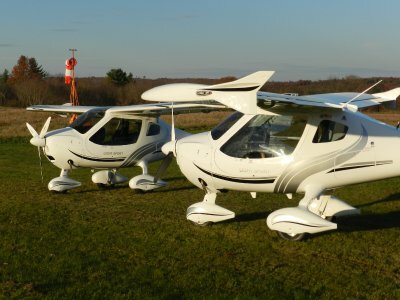 5 hours of transition training is included with the purchase of a new aircraft, and used airplanes typically do not have a checkout included in the price. SLSA aircraft handle differently than conventional aircraft and the legacy CTsw and current model CTLS require transition training to help ensure a happy transition. We strongly recommend that you have a QUALIFIED and Experienced CTsw or CTLS instructor fly with you and you complete the transition syllabus. Insurance companies have offered discounts to those who have completed this syllabus. Flight Design distributors have helped arrange financing, taken airplane trades, and arranged partnerships, The are able to perform repairs, do warranty service and support the entire line of new and used aircraft. We have have a large network of independent service centers that can do routine maintenance and Rotax engine service. This network can be especially helpful when traveling away from your home airport. If you need information on aircraft ownership or purchase, please contact us using the “contact us” link or by calling 860-963-7272 .